Additional high-grade gold intersections from drilling at the new Ndongo East discovery in Ghana, just 24km north of CDV’s 6.5Moz Namdini Project, with intercepts including 3m @ 29.3 g/t Au. CDV has performed solidly since our coverage initiation back in June 2016, driven by consistent and highly successful exploration drilling programs at its flagship Namdini project in Ghana, which in turn has led to the establishment of a multi-million-ounce gold resource base. Whilst CDV pursues additional resource growth, it’s also strongly focused on advancing Namdini to production status and is undertaking a Bankable Feasibility Study (BFS), detailed metallurgical test-work and process flow-sheet studies. CDV has also enjoyed immediate exploration success at its new Ndongo East discovery, just 24km north of its Namdini project, with high-grade near-surface gold mineralisation over a 1.2km strike length that’s hosted within a larger target area that measures approximately 7km in strike length. 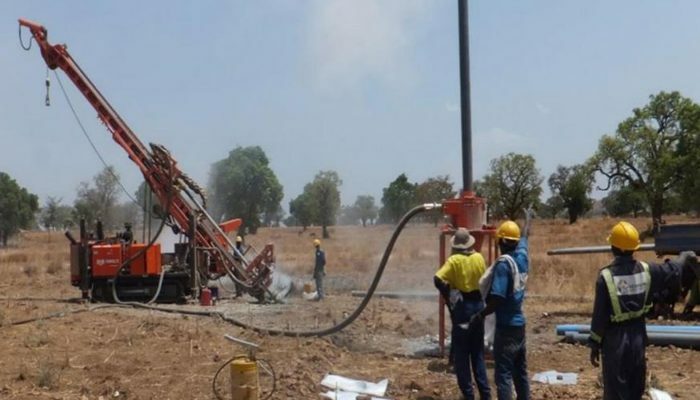 CDV is also maintaining exploration programs at its Bolgatanga (Northern Ghana) and Subranum (Southern Ghana) Projects. 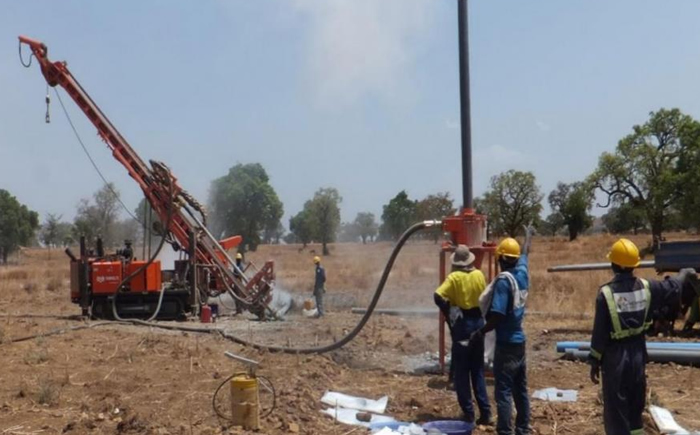 Our most recent coverage of CDV during late 2018 focused on the company’s initial drilling success at its brand new Ndongo East discovery, in particular the high-grade nature of the gold mineralisation that had been encountered close to surface. CDV has since announced further highly encouraging drilling results that both reinforce the high-grade nature of the mineralisation and its relatively shallow depth from surface, but additionally extend the mineralisation both at depth and along strike. 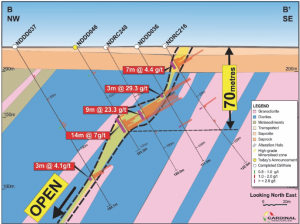 The latest drilling results include a high‐grade gold intersection comprising 14m @ 7.0 g/t Au from 69m depth in diamond hole NDDD046 (including 2m @ 42.2g/t from 80m). Previous high‐grade gold intersections include 9m @ 23.3 g/t Au from 60m in RC hole NDRC248 and 3m @ 29.3 g/t Au from 45m in diamond hole NDDD036. These are reflected in the graphic below and note the proximity to surface. The significance of the Ndongo discovery is that it lies just 24km north of CDV’s Namdini project, which hosts a Maiden Probable Ore Reserve of 4.76Moz. This new discovery has the potential to add further near-surface high‐grade gold ounces to the Namdini resource/reserve base, which could have a major beneficial impact on project economics. 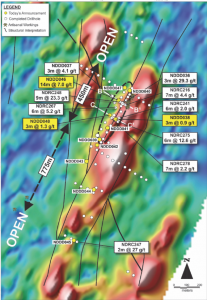 The Ndongo East discovery is particularly encouraging, with the initial 450m strike length of strong, shallow gold mineralisation remaining open both along strike and at depth. 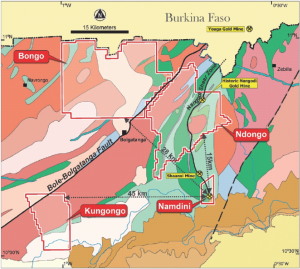 Beyond this initial mineralised zone, a further 750m of gold mineralisation has been intersected along strike towards the southwest, which appears to be extending the overall gold mineralisation of the Ndongo East discovery to approximately 1.2km. Figure 2: Ndongo East Prospect with Drill Locations on Ground Magnetic Image Showing NE‐SW Mineralised Structures Open Along Strike. The license area is considered highly prospective for the discovery of economic gold mineralisation associated with the prolific Nangodi Shear Zone, a splay fault off the main regional‐scale Bole‐Bolgatanga Shear. The Nangodi Shear Zone is spatially related to at least four significant gold discoveries – CDV’s Namdini Gold Project, the Shaanxi Gold Mine, the historic Nangodi Gold Mine and the Youga Gold Mine in Burkina Faso (adjacent to the Ghana border). These mines can be cleary seen on the graphic below. In addition, there are numerous historic shallow artisanal workings along many parts of this shear zone -including the Dusi, Zug and McGuiness Prospects – which all fall within CDV’s license area. The gold mineralisation in these locations appears to be developed at, or near, the diorite‐granodiorite contacts where competency differences create brittle fracturing, which allows the ingress and precipitation of mineralising fluids. The mineralised system is open along a northwest‐southeast strike and at depth, with multiple mineralised intersections. From a regional perspective, the Ndongo East prospect lies within a larger target area of approximately 7km in length that has yet to be drill-tested. 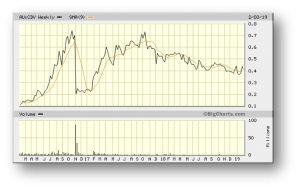 So exploration/resource upside potential here must be considered significant. Accordingly, the current diamond drilling that recently re‐commenced following the end of the wet season, will continue and will steadily ramp up as ground conditions improve and prior drilling results are interpreted. CDV’s early-stage drilling activities at its Ndongo Prospecting License are highly encouraging, particularly given the potential to add high-grade, near-surface incremental ounces to its planned Namdini project development. The PFS results released during late 2018 presented a compelling business case to progress the Definitive Feasibility Study (DFS), which is exactly what CDV is doing. The BFS is fully funded and on track for completion in Q3 2019. 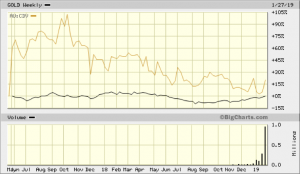 The graphic below also shows that over the past 2 years, CDV has significantly outperformed the spot gold price. Gavin Wendt is the Founder and Senior Resource Analyst with MineLife. He has been involved in the Australian share market for more than 20 years as a resource analyst, employed primarily within the stockbroking and finance industries.